Paper Size: 30.5" x 24"
Marine Scout-Bombing Squadron 244 (VMSB-244), calling themselves the "Bombing Banshees" was the first Marine Corps Squadron to fly the Curtiss SB2C-4 in combat operations during World War II. This Curtiss dive-bomber, designed in 1939, intended to replace the obsolescent Douglas SBD "Dauntless" dive-bomber, needed many time-consuming design corrections before it could begin to replace the much-beloved Dauntless as a combat-effective weapon. Helldivers dropped bombs from an internal bomb bay or from underwing racks, dropped depth charges, strafed with 20mm canon, and fired rockets which were mounted under wing. These two are seen off the coast of Mindanao, in the southern Philippines, in June, 1945.Four five-inch high velocity aircraft rockets (5" HVAR) can be seen protruding from under the wing of the nearest aircraft. VMSB-244 was assigned to the First Marine Aircraft Wing (MAW-1) from March 1, 1942 to June 10, 1946. Shortly after assignment to MAW-1, the Bombing Banshees became part of Marine Aircraft Group 24 (MAG-24)....participating with distinction in both the Bougainville and Philippines campaigns. 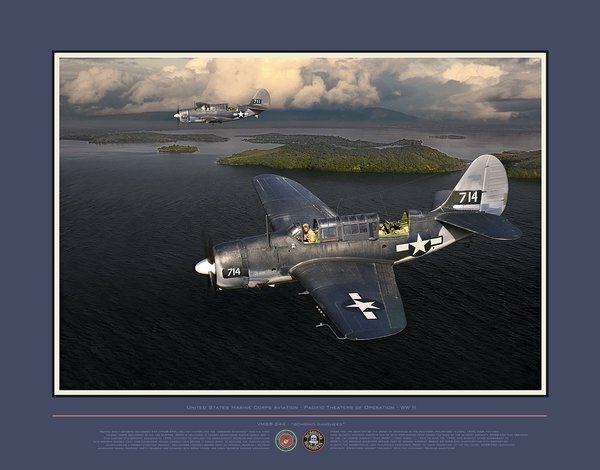 Prior to their transition to the Helldiver, VMSB-244 conducted offensive operations against the enemy with the venerable Douglas Dauntless.